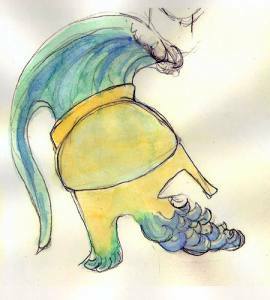 I’m very happy to announce that I’ll be doing the puppet design for a production of Neil Gaiman’s Odd and the Frost Giants at Stages Repertory Theatre in Houston, Texas. 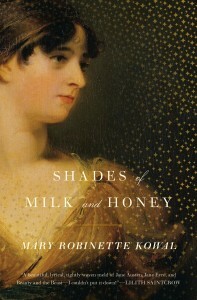 This adaptation is by Robert Kimbro. He and I have worked together on other projects in the past and I’m incredibly excited to be involved in this world premiere. It’s scheduled for May of 2011. I’ll keep you posted as more details develop. I was working on updating my portfolio today and chatting with someone who didn’t know that I built things. Puppeteer, yes. But the fact that, in my case, the word puppeteer also includes designing and building, in addition to performing, was new information. So, I thought I’d share my portfolio with you. Sometimes when dealing with props I can’t find the real thing or even a replica of it, so I just have to make it. 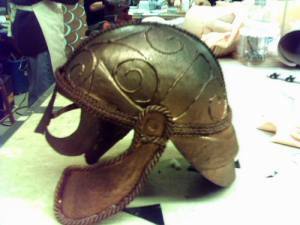 In this case, we needed a Pictish helmet as one of the apparitions in MacBeth. 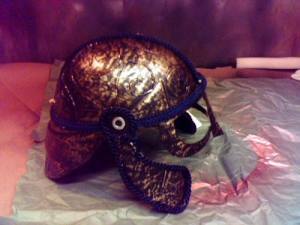 The halloween stores had loads of helmets, but were strangely lacking in anything Pictish. Spartan on the other hand… those were everywhere. So I picked up the helmet in the photo for $9.00. It’s cheap vacuformed plastic and only vaguely the right shape. Next up, I used basic braid to create the decorative flourishes from my reference photo. The spiral patterns I did with a judicious use of hot glue as a design element. Meanwhile, inside the helmet, I ran a hoop of armature wire to stiffen it and get rid of the woogedy-woogedy movement. 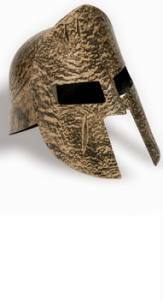 Seriously, if you’re a warrior, you don’t want your helmet quivering. To finish it off, I spray painted the whole thing bronze and then spattered it with a little black to give it a patina of age. Ah… I love it when a plan comes together. 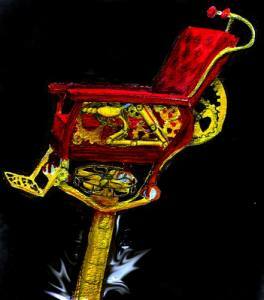 What Would a Steampunk Gibson Chair Look Like? io9 covered our panel on steampunk design. One of the most interesting panels at this year’s Readercon was an exploration of the steampunk design movement, as it emerged into the mainstream with May’s New York Times Style article. Writer/puppeteer Mary Robinette Kowal, YA fantasy novelist Holly Black, Tor editor Liz Gorinsky, and speculative fiction writer Sarah Micklem gathered to show off their steampunk creations, discuss steampunk’s literary origins, share their favorite steampunk websites … and, of course, to design a Gibson chair for the fannish masses. 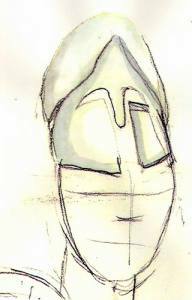 I told someone that I had been tempted to take an easel and pad and draw the chair as we designed it, using a Morris Chair ((The title of the panel relates to Gibson Girls, William Gibson and the Morris Chair)) as the base. Ha! Like I’d have been able to do that and participate in the discussion at the same time. But… I did do it this morning over breakfast, after a commenter in the thread at io9 suggested that such a thing might be made if only there were a design. Well, the director wasn’t keen on the helmets because he wants to preserve the uniqueness of Athena’s helm and feels that it will be less special if everyone gets one. I argued that since the play is supposed to use things that come off of the Odysseus’s ship, that helms make a good deal of sense. I think they lend a consistency to the abstractions in the show. He really wants Athena to be the only one with a helmet and he also wants movement and beards. So, these are the thumbnails I’m sending up to him. Thankfully, he liked everything else I sent him. 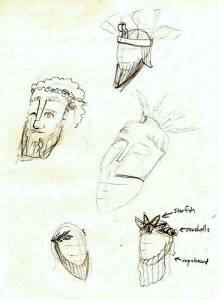 I’m designing props and masks for The Odyssey Experience for McCarter Theatre’s education department. Here are the drawings I’m sending up to them for review. The idea is that rather than masks, each character has a helm which they wear, to signify which character they are. Athena has her classic helm, which I want to be silvered to make her really shine. Athena’s shield plays with the look of Greek vases. 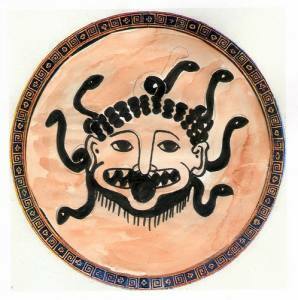 However, that is the most unfortunate Gorgon that I’ve ever seen. I was working from an actual vase and yet somehow I’ve wound up with Betty Boop. Again, using the lines of a vase, but here, for the Eagle, it is batiked on China silk and used like a ribbon dancer. For Poseidon’s helm, I’m using the shape of his beard to suggest waves. I also want to make this one look like copper with a heavy blue-green patina in the beard. From the crest I want something that has the shape of a classic Spartan plume, but can double as a wave about to crash down. Finally, Zeus. Here I see weathered bronze and gilding. I’ve got no idea if the director will accept these or not, but I’ll keep you posted. Is there a better way to start off the New Year than listening to Dr. Seuss’s Green Eggs and Ham, Chaucerâ€™d? I don’t think so. Early next year, Subterranean Press will give birth to a new imprint, Far Territories, one that focuses on popularly priced trade paperbacks and hardcovers, with distribution in the chain and independent bookstories. From August of 1994 through the spring of 1997 Mary and I toured a production of â€œPied Piperâ€ with Tears of Joy Theatre. We were particularly close to this show because Mary designed it and I wrote the book, music, and lyrics. We had lots of adventures during this tour: towing a truck through a blizzard on the Bear Mountains, being taken from a hotel room in the middle of the night by Officer Monty, losing my big toenail during a performance…but be careful when dealing with the Piper; you never know what might get charmed away. 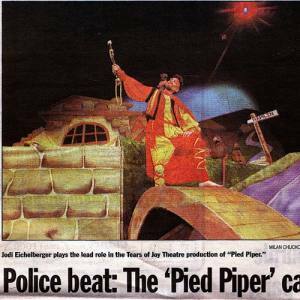 On the morning of April 16, 1996 the â€œPied Piperâ€ disappeared, along with our van and all its contents. He invited me to relive memories of our tour with Pied Piper. You should listen to find out who stole the Pied Piper. Today I made a wing, proofread, designed an anthology cover, wrote, edited and did laundry. Details on some of those activities when I am not aching with the need for sleep. Edging out of the computer woes. Whew. Already I feel better. I just dropped my computer off with Karl Swan, who not only promised to have it back to me within 48 hours, but also pulled some files off for me right then. Though I’d done a backup on the 27th, I’d also done a significant amount of work between then and when the computer imploded on the 29th. So, I now have the current draft of my novel, current drafts of the two short stories I had been working on, and the logo design that had just been approved when things went pfffht. Everything else, I have on the backup. We decided to go with a system wipe and restore. He made me feel like I was not an idiot, which was nice. When I get my computer back, it will be clean and with my documents already loaded on. So, I will not have to continue going crazy trying to fix it.